At last Wednesday's meeting we had 15 Members and a guest, Nancy Lee. The 4 way test was read by Frances. Abigail reminded us that this Wednesday was the international day of peace. Each year, Rotary selects up to 100 individuals from around the world to receive fully funded academic fellowships at one of our peace centres. These fellowships cover tuition and fees, room and board, round-trip transportation, and all internship and field-study expenses. In just over a decade, the Rotary Peace Centres have trained more than 900 fellows for careers in peace building. Many of them go on to serve as leaders in national governments, NGOs, the military, law enforcement, and international organizations like the United Nations and World Bank. 1) Ted is promoting the “ Rotarian save live-CPR/AED training and certification.” The session will be on October 29 near the Seabus terminal in North Vancouver. Please get in touch with Ted if you would be interested in attending. 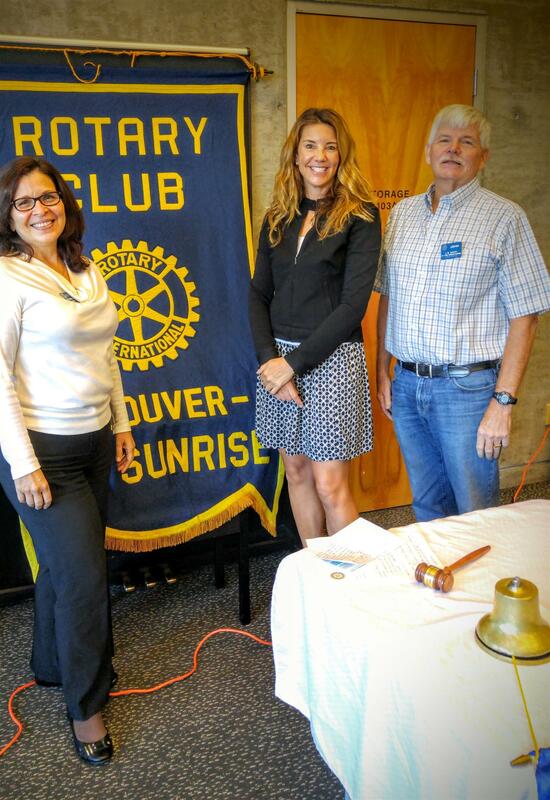 2) Our District Governor will be visiting our club on October 12th, make sure to attend that meeting. 3) Our meeting on October 19th will be at the Food Bank, make sure you make a note of this. 4) Project Amigo is our chosen International Project to sponsor over the next 3 years. Project Amigo ( formerly Rotary Project Amigo) has been in operation for 30 years helping the poor rural kids of the State of Colima, Mexico to get an education and help themselves and their families out of systemic poverty. It has been and continues to be a huge success and our contribution will help it to continue to grow and service the underprivileged children in the area. Please check out the website at: www.projectamigo.org. Guest Speaker - Our guest speaker today was Sheryl Borgmann. She is the regional manager for the Lower Mainland/Fraser Valley region for Junior Achievement of BC. JA is the world’s largest NGO dedicated to educating young people about business. With over 120 member organizations worldwide, JA brings a global view of business to local communities. Since 1955, British Columbia schools have relied on JA to inspire and prepare youth to succeed in an ever-changing global economy. In 2016, over 38,000 BC students benefited from JABC programs delivered free of charge by volunteers from local business communities, who bring their real-life experience into the classroom. JABC programs focus on work readiness, financial literacy and entrepreneurship, giving students the confidence and skills they need to become the next generation of business and community leaders.